A few weeks ago - while Steve was on holiday - we did something that we've been avoiding for months: we started leaving our toddler to fall asleep on her own. I hesitated to write about this because it sounds a bit too much like sleep training. We didn't do sleep training; it's not for us. And the impression that I get is that most of the parents who stop by here are the same - most of you decided against controlled crying, cry it out or anything of their ilk. But this isn't sleep training. Not that sort of sleep training, anyway. There were no tears involved. We were just getting tired of having to sit in her bedroom every evening until she fell asleep. Long gone are the baby days when we had to rock her or bounce her or give her a dummy until she nodded off. Long gone are the days when she could fall asleep lying down, but only if she was holding our fingers. And the days when she could sleep without holding our fingers, but needed us to be sitting on her bed. A long time ago now, we progressed to being able to pop her into bed, sit on a chair at the other side of her room, and read by the glow of our Kindles. And then we just sort of... stalled. Bedtimes were easy. 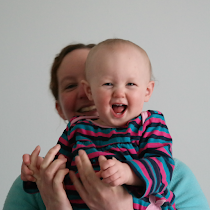 As soon as she dropped her last nap (at about eighteen months - which has pluses and minuses, but is what it is), bedtimes became fast and simple. We would do dinner, twenty minutes of getting her into her pyjamas and messing about, teeth, two bedtime stories, potty, hug and within ten minutes she would have conked out. It was no big deal to spend ten minutes sitting in her room, reading, while she drifted off. In fact, most of the time, it was a lovely, calm way to end the active parenting/working part of the day. We were in no rush to change things. But recently the twenty minutes of getting her into her pyjamas and messing about had become a bit more of a battle. She insisted that she didn't need to put her pyjamas on because she was NOT sleepy; she didn't need to lie down because she was NOT tired; she wanted to bounce on her bed, not close her eyes. We nodded; we knew; she didn't have to go to sleep, if she didn't need to; she just needed to rest so she would have some energy for [insert the next day's fun plans]. Once she was in bed, she would spring back out every thirty seconds or so, choosing new soft toys, insisting she needed another pee, trying to climb on our laps for extra cuddles. We knew that she was ready to sleep because, as soon as she stopped moving, she would pass out cold. But it was becoming increasingly clear that, as long as she had an audience, she was going to drag out the interactions. Bedtimes went from being a relaxing break to a source of irritation. Stern voices sometimes had to be used. We experimented a little - if we waited until she was lying down in bed, we could leave the room for a few minutes "to pee" or "to quickly do something" and come back to find her asleep. Our constant presence was clearly not essential to her losing consciousness. So we talked to her. We told her we believed she was ready to go to sleep on her own; she agreed that that might be the case. We would tuck her in, give her a kiss and a promise to check on her a few minutes later. For the first few nights, we didn't have a chance to prove that our promises were good - she was up and out of her room every few minutes, chattering away about her absolute lack of exhaustion *yawn* *eye rub*. For the first few days, we spent A LOT of time role playing bedtime with her teddy bears. 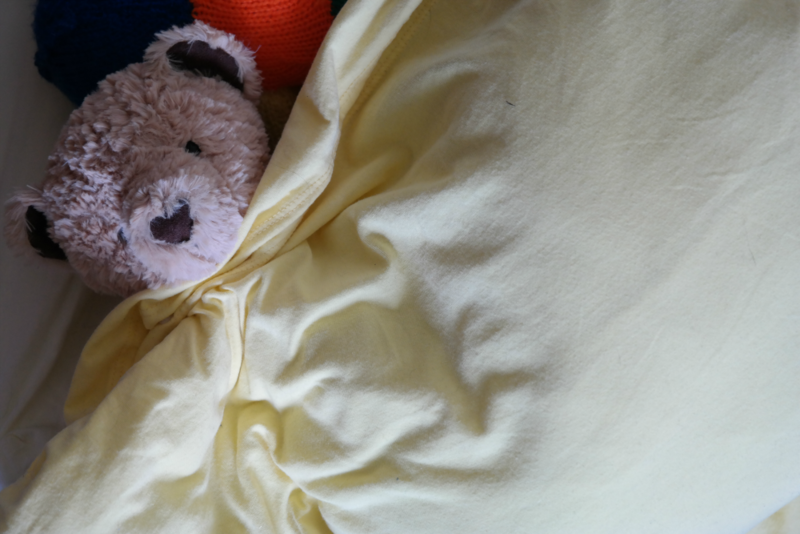 Daddy Bear (always Daddy Bear) would tuck Little Bear into bed, then go to wash the dishes, returning every few minutes until Little Bear fell asleep. And, slowly, she started to believe what we were telling her. She started staying in bed and waiting to see if we would return. She started staying in bed, knowing that we would return. She started drifting off before the fourth check, then the third check, then the second check and - now, sometimes - even before we've checked on her at all. As with so many things, we don't know why we left it quite so long. But we are glad we waited until she was old enough to understand, to discuss it with us and to find ways of processing it for herself. We didn't want it to be a source of distress; we wanted it to be an active step forward which she could feel proud of taking. Three weeks on, bedtimes are easy again. Oh, she's still NOT tired, NOT sleepy, doesn't need her pyjamas on etc etc etc. But, once she's had her hug and her kiss and been tucked in, things are calm. How did you tackle toddler sleep?